What new security requirements apply to Persistent Memory (PM)? 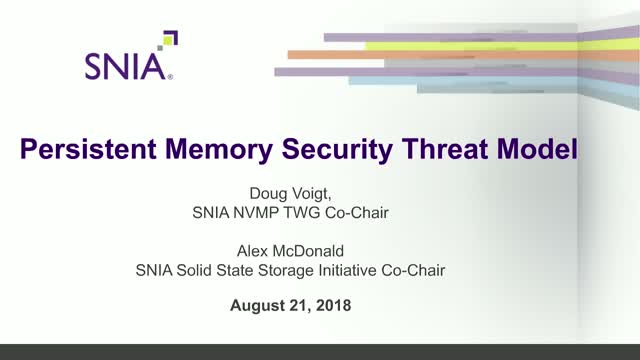 While many existing security practices such as access control, encryption, multi-tenancy and key management apply to persistent memory, new security threats may result from the differences between PM and storage technologies. The SNIA PM security threat model provides a starting place for exposing system behavior, protocol and implementation security gaps that are specific to PM. This in turn motivates industry groups such as TCG and JEDEC to standardize methods of completing the PM security solution space.